Why is it that the simple act of meditation — sitting and breathing — can be so difficult? Even if you’re listening to a guided program where you’ve got someone giving instruction, it’s still hard to meditate! Whether it’s thinking to the future or lingering in the past, the mind will always wander. It was designed to think, after all, so really, it’s just doing its job. The trouble comes when we are meditating and we want to stop thinking. This will never happen. Just like our breath never stops, neither does the mind. What you can work on in your meditation is to slow down your thinking and not engage your emotions with each passing thought. But since this is much easier said than done, it’s helpful to have some sort of anchor for your attention so your mind has something to focus on. This way, you can keep your mind busy with the business of meditation. Then you’ll have a happy mind! Different meditation styles have different anchors for the practice. If you want to succeed at meditation, it’s best to choose a style that suits you. 1. Breath. This is the most popular way to harness your attention during meditation because it’s so accessible. There will always be another inhale or exhale to focus on. Counting breaths is one way to keep your attention anchored. Counting backwards is another technique that is slightly more challenging, which may be more engaging for a wandering mind. I like to feel my breath as it fills my body while meditating. This makes my breath deeper while relaxing my body, which helps to calm my mind. 2. Mantra. Some people may be put off of mantra meditation because often the words said (or chanted) are in another language so it can be hard to grasp because of the unfamiliarity. Also, mantras can get caught up in religious affiliations, which may be unappealing. But really, mantra meditation is just another type of anchor for your attention. You can say whatever words you want — it doesn’t have to be prescribed by some ancient guru. The purpose is to attach your attention to the words and stick with it. I like using the words “I am” as a mantra for meditation. This helps reinforce a positive belief system for myself and it’s simple to understand. 3. Sound. While mantras do have sound embedded within, there’s another type of attention anchor that relies on the sounds in your environment. This is great if you live in a city where there is a constant stream of noise outside your window. For this you would place all your attention on whatever sound you hear. You’d stay with that sound until it completely fades, and then you’d go to another sound. Even quiet houses have sound around them. I’ve heard clanking radiators, birds, and wind while meditating in a country house. Once we quiet down inside, the sounds around us become much more prominent. 4. Body. Using the sensations within your body is also another way to anchor your attention. If you are sitting in a chair you could bring your awareness to your feet and notice how they feel as they touch the floor. If you’re sitting cross legged, you may notice a cramping around your legs. While you may want to disassociate from this feeling, remember that it will pass, and try to use the mild discomfort as an anchor for your attention. Obviously, whenever you feel something more severe, like a sharp pain, you’d want to shift your body to pass that sensation quicker. 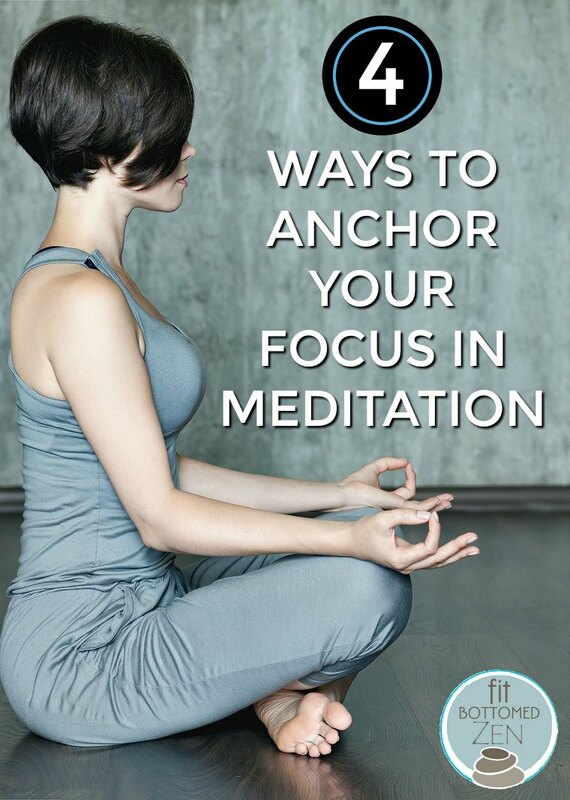 The great thing about meditation is you don’t have to stick to one anchor. You can use all four in one session, if you like. So you could start off with your breath, then move into a mantra, which leads into following the sounds around you, and finally tune into the sensations inside your body. Whichever anchor feels most natural is the one you could create your practice around.